Donnelly Distribution was founded by Richard Donnelly in 1976. Rich started the business in his brother’s garage with one customer delivering 30,000 grocery store circulars. 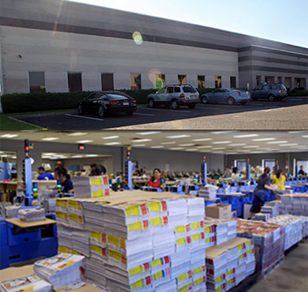 Since then the company has become the areas largest distribution companies reaching nearly 900,000 homes every week. The weekly advertising program carries millions of circulars each week. The clients are of every type from the local pizza shop to the largest fortune 500 retailers. The core team of professionals have hundreds of years of experience in all facets of ad delivery – door hangers, flyers, door stickers and samples. The directors and managers rely on that experience “in the shop” and “on the street” to make sure the jobs get out on time and delivered properly. The 44,000 square foot warehouse is conveniently located at the foot of the Betsy Ross and Tacony bridges with easy access to Philadelphia and major roads. The warehouse has ample space for storage of advertising inventory and assembly of the work. The business has 6 forklifts and 20 trucks along with this ultra-modern collating equipment. Donnelly’s primary service area is the Philadelphia DMA (designated market area) – covering the county/city of Philadelphia, Bucks, Montgomery, Delaware, and Chester Counties in Pennsylvania and Burlington, Camden and Gloucester counties in Southern New Jersey and northern Delaware.